Introducing our second instalment in our Cake of the Month offer! 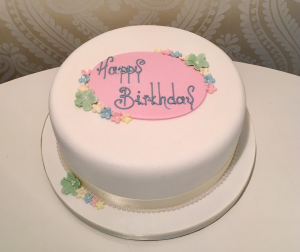 This lovely 8″ round cake serves up to 25 finger portions and can be customised to suit any occasion by simply changing the colour scheme and/or piped message. Pay £40 now (a saving of £15!) and book in for any date this year! Call us on 0141 339 4387 to enquire about this offer. Previous story Cake of the Month + Christmas Goodies!